It looked like any other music department classroom at UCLA on Dec. 6, with the chairs rapidly filling up and a group of musicians warming up at the front. 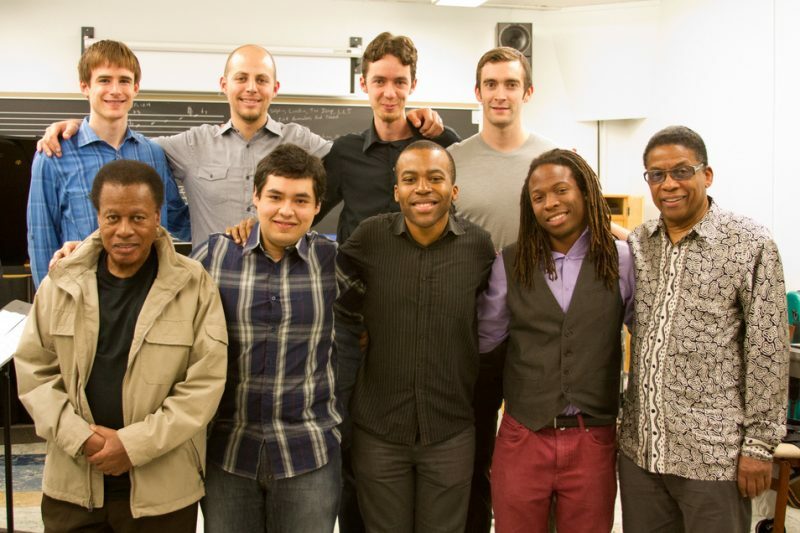 But instead of students, the note-takers were journalists who had been invited to a unique experience: a master class with Herbie Hancock, Chairman of the Thelonious Monk Institute, and Wayne Shorter at the helm. Their presence, along with other guest faculty, introduced the return of the Monk Institute to Los Angeles after an extended period in New Orleans. Both Hancock and Shorter are taking on professorial responsibilities with the Thelonious Monk Institute of Jazz Performance at UCLA. The young musicians in the front of the room-trumpeter Mike Cottone, alto saxophonist Josh Johnson, trombonist Eric Miller, drummer Jonathan Pinson, bassist Dave Robaire, pianist Miro Sprague and vibraphonist Diego Urbano-are members of the Institute’s new Class of 2014, the first since the return to UCLA. Eager to show their musical wares to their stellar professors, they played with the near-professional skills characteristic of past Monk Institute ensembles. The piece finished, the players waited for reactions. Over the nearly two decades that the Monk Institute of Jazz Performance has been in existence, the instructional staff has included, in addition to Hancock and Shorter, the likes of Kenny Barron, Jack DeJohnette, Ron Carter, Dee Dee Bridgewater, Dave Holland and Horace Silver, among many others. For this class, it wasn’t just Hancock and Shorter waiting to make their observations. Joining them in the instructors’ seats was trumpeter-composer Herb Alpert, whose $30 million financial support for UCLA has resulted in the naming of the UCLA Herb Alpert School of Music. But Alpert was there as more than a philanthropic foundation head; he was there as a jazz artist with a host of accomplishments. 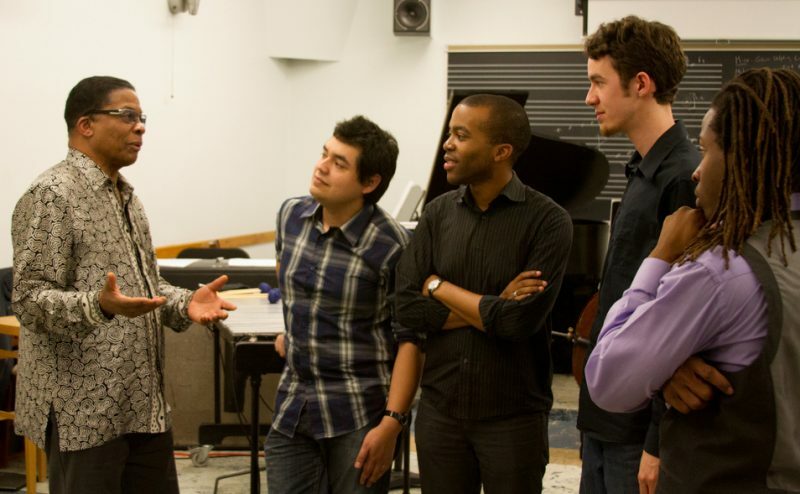 As the students listened closely, the comments by Hancock, Shorter and Alpert stressed the importance of finding one’s own identity as a jazz musician. Hancock and Shorter, veterans of Miles Davis’ “second great quintet,” both supported their views with occasional references to the guidance they received from Davis. Appropriately, Hancock, Shorter and Alpert offered their responses in their own unique styles: Hancock, as ever, was articulate and focused, speaking with a humorous tone and in a supportive manner. Shorter’s comments recalled his playing, using spoken language with the same complex, arching thoughtfulness he brings to his often-abstract improvising. And Alpert, underscoring the importance of individuality, expressed his views with the cool, relaxed phrasing that has always been present in his trumpet work. Listening to the interaction between the young musicians and the trio of veteran artists was a vivid reminder of the importance that mentoring has always had for young players. And, at a time when many jazz school graduates seem to possess more technique than creativity, one could only welcome the Monk Institute’s blend of traditional music education, active performance and mentoring with established artists. The Monk Institute of Jazz Performance, a tuition-free two-year graduate-level program, was created by Tom Carter, President of the Institute, in September 1995 at New England Conservatory. Stints at the University of Southern California and Loyola University in New Orleans followed, and now the Institute has moved to UCLA. But it will not terminate its connection with New Orleans. Instead, it will continue to maintain an outreach program in the New Orleans public school system, as it has in other past academic relationships. After the class came to an end, a buffet lunch provided opportunities for journalists to meet the individual members of the Monk Institute of Performance 2014 class, as well as the high-profile instructors. And there was no doubting the good vibe that was circulating throughout the room, from the elation and excitement of the young players to the equally enthusiastic comments of Hancock, Shorter and Alpert. But it remained for Tom Carter, President of the Monk Institute, to sum up the move to UCLA with perfect succinctness. “Things are looking good,” he said.